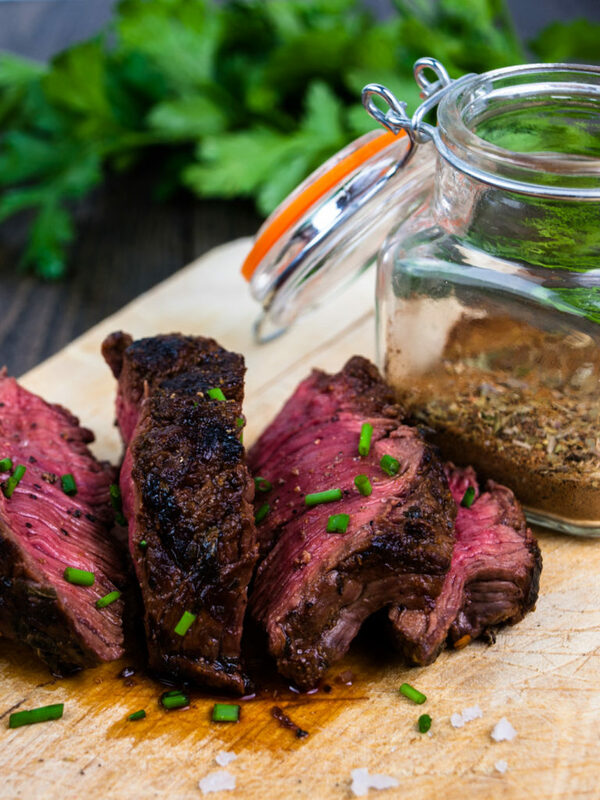 Check out this tasty spice rub that will kick your steak skills to the next level! You don’t need to use the entire rub at once. Put it in a sealed jar and it will hold for a few weeks easily. When I’m using this rub, I usually go for cheaper kinds of steaks. The rub is quite flavorful and a real proper steak shouldn’t be overpowered by spices at all. Still, once in a while I just crave a really good piece of meat and this rub will totally make sure you end up with one! Get some steak, score it with a knife in a criss-cross diamond-shape pattern, rub your spice rub on the outside and into the crevices. Heat up a pan, sear your steak and enjoy! Or slice up your cooked steak and use the strips on a taco or in a burrito. Congratulations, you just bought yourself a ticket to tex-mex heaven! Give it a try – I promise you won’t be disappointed! Well, it’s a spice rub– you know how to mix spices together right? Mix all ingredients well and use immediately on a piece of meat, or store in a glass jar with a lid. Rub the mixture on some piece of meat and enjoy this incredible extra depth of flavor! Let me know what you think about the spice mix in the comments below! Have you ever used espresso in a savory dish before? It gives it a really nice depth of flavor, right? Do you think there is anything missing in this rub that would make it even better? Add your comments below and let’s perfect this rub together!